Today, I want to give you a tool for improving your stories. It’s a diagram to show you what your story should look like. I draw it on chalkboards and flip charts and white boards and paper everywhere! This diagram is the core of my approach to storytelling. I use it to plan my stories and to work on other peoples’ stories. You should be using it, too. 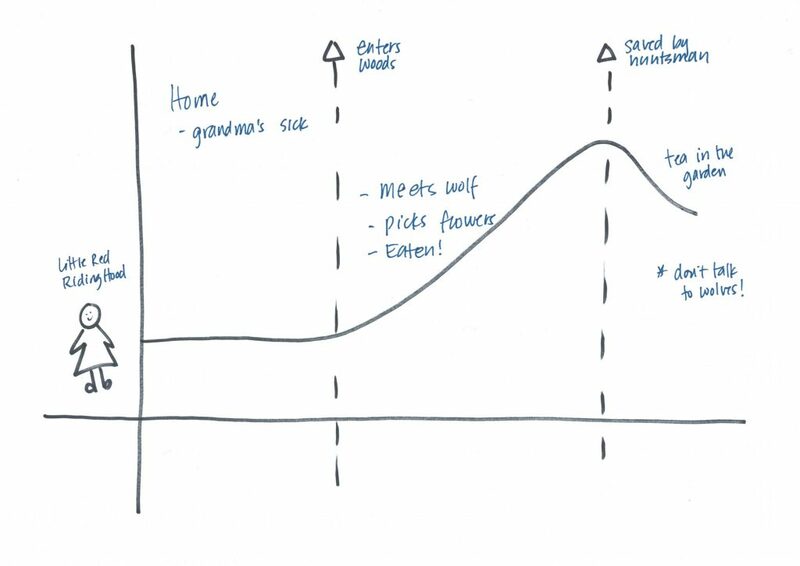 If you have a story to tell or a presentation to give, sketch this out and use it to plan the broad lines of your story before you start adding details. A visual approach is helpful because you can use it to note the most important moments in the story and see those moments relate to each other. These relationships are the difference between a story and a series of events on a time line. They are also the way you engage your audience, by adding a little excitement to your story. All stories are exciting because the hero’s purpose matters and the audience doesn’t know how the story will end. In this article, I’m going to explain what’s on the diagram and how you can use it to structure your stories. You’ll find a few examples from film and working life and we will always come back to Little Red Riding Hood as a model. In the past, I’ve used this model to diagram stories about zebra fish larvae, a vaccine experiment, a parasitic wasp and a caterpillar, and my own. It’s super flexible and easy to use! The diagram is based on a graph with two axes. 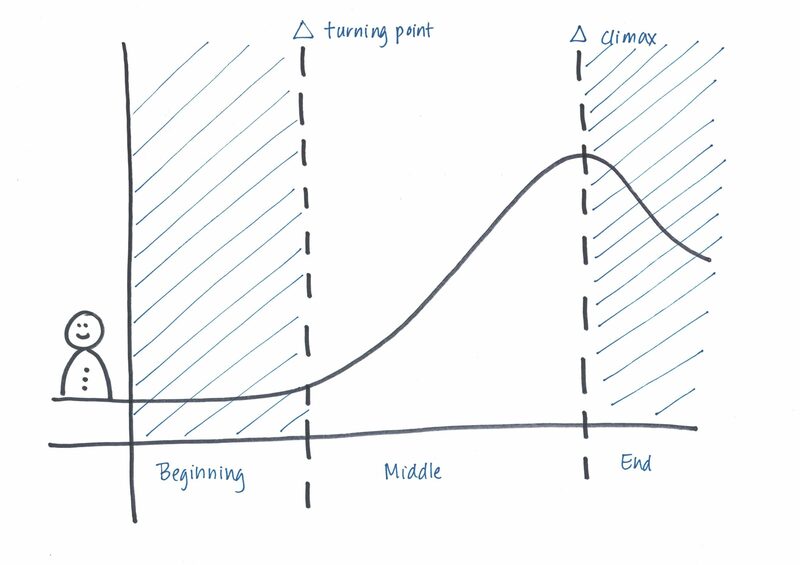 The horizontal axis is time, the time during which the audience experiences the story. 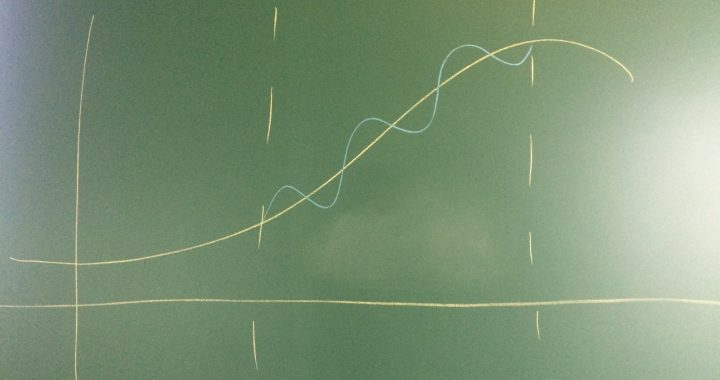 If a movie is 90 minutes long, that line represents 90 minutes of story. If you’re going to tell a 7-minute story at the beginning of your presentation, that line represents 7 minutes of story. The vertical axis represents emotion or tension. Think of it as a measure of your heart rate. In the beginning, things are all calm and familiar. You’re relaxed. In a great film, things start to happen and holy moly, the palms sweat, you’re gripping the seat, you’re getting emotional because someone might fall off a building! In a great TED Talk, the audience realizes that the hero, or even humanity, has a lot to lose if we don’t, say, start changing our food production and distribution systems. The line of the hero’s journey through the story shows the emotional journey the audience goes on and how much the hero has to lose as the story moves forward, less in the beginning and a whole lot towards the end. Since we are using Little Red Riding Hood as our example the time line represent maybe 5 minutes. The audience’s emotions will rise as she gets closer to her face-to-face encounter with the wolf at her grandmother’s house and she’s going to have more to lose as she gets closer to being eaten by that wolf. On the left side of the diagram is your hero. The hero is the person, animal, or idea the story is about, they are the one who is going to be transformed by their experience in the story. The hero gives the audience an individual to focus on. Our hero is Little Red Riding Hood. The hunter might be the person who rescues Little Red and her grandmother from the wolf, but she’s the person we follow and develop an emotional connection with throughout the story. The audience is listening to find out how her adventure ends. Aristotle told us that stories need a beginning, middle and end. So here the story is divided into three sections, from left to right, the beginning, middle, and end. Each section of the story needs our attention. Your audience needs to meet a hero and find out where they are from as much as they need closure at the end. Think of your story as an affair. You need some time to get to know each other, there will be ups and downs in the middle, and you’ll need closure at the end to move on with your life! The beginning and the end of the story take place in the ordinary world. The ordinary world is a familiar place, to the hero. The middle of the story takes place in a story world. Think of the story world as a place where the rules are shaped by the challenges the hero will face on their quest. Most of the Harry Potter films establish a clear division between these worlds by having a muggle world and a wizarding world. Especially in the early films, Harry starts and ends in the muggle world every time. A scientist might take a question or a problem from the wide world and deal with it in a laboratory. There are many ways to think about and create ordinary and story worlds in your story. Little Red Riding Hood’s normal world is the world of mothers and baskets of food and sick grandmothers. In the story, the woods she has to walk through to get to her grandmother’s house represent a tangible story world. She enters the story world almost as soon as she leaves home and leaves after she’s been rescued. 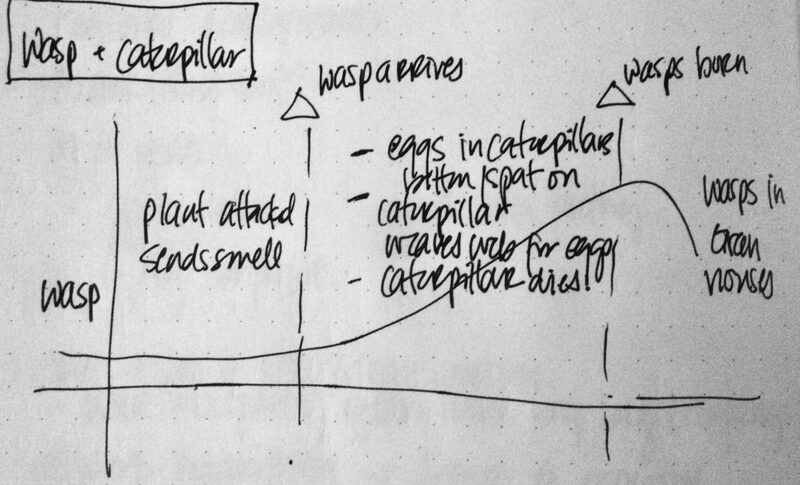 There are two dotted vertical lines on the diagram that represent transitions from one section of the story to the next. These are parts of the heroic journey that should be included in your story planning. The original hero’s journey was described by Joseph Campbell in The Hero with a Thousand Faces and has 17 steps. Christopher Vogler did some work to summarize it. Here, they are gathered broadly in the beginning, middle, and end. But the turning point and climax need special attention. The turning point is the point in the story when we transition from the beginning to the middle. It’s when the hero commits to their quest. I always imagine someone stranded in a broken car on a dark road in the middle of the night with no cell phone reception. There have been news reports of an escaped serial killer from the local prison. Do they get out of the car or not? The future of the story will hinge on their decision. For a researcher, it could be an encounter with the right collaborator or the decision to take on a particular question that moves them forward to the middle of the story. For Little Red Riding Hood, this moment comes when she leaves the house with her basket of goodies and enters the woods. After this point, the story moves into the building action of the middle. The second moment is the climax of the story. It comes between the middle and the end of the story and it’s the moment of all or nothing, live or die, win or lose. This is the moment when the hero has the most to lose. In an action movie, you can expect a life or death scene. For a scientist, it could be finding particular results or proving a hypothesis true (or false). For Little Red Riding Hood, this is the point in the story where she’s been eaten by the wolf and the huntsman turns up to save her and her grandmother. This is followed by the emotional relief of the end of the story. Now I’d love to see you use this diagram to either analyze a story you’re already telling, analyze a movie or show you love, or plan a story you want to tell. How can you do that? Write your hero’s name right above their head. If you’re planning a story, write down your hero’s goal next to the climax. Write down where the story starts in the beginning. Make a note about what starts the action by the turning point. Write keywords about the events in the middle of the story. Check your climax, does the hero achieve it? Make a note about how your hero is transformed in the end. The more you do this, the more you’ll see how planning these moments makes your stories more powerful. You will tell stories with the confidence that your story hangs together just like you want it too! Over the next few weeks, I’m going to go into more detail here about each of the different sections of the story. You’ll get a better idea of how to shape the different elements of your story to make it more effective. I’m so excited to share this with you and answer any questions you might have about how to use this story diagram to analyze or plan your stories! Please share your comments or questions here, I’ll be paying attention and posting answers. If you want to make sure you don’t miss out on my more detailed posts about heroes, beginning, middles, ends, and everything else story that I can think off, sign up for my mailing list! You’ll get an email every week letting you know what’s up! And if you have a question and want to ask me in person today (really). Check out my Facebook Live every Thursday at 15:00 Central European Time. It’s going to be a fun one! Did you like this article? Sign up for the StoryCraft newsletter and make sure you don’t miss the next one! Posted in Story Structure, Storytelling and tagged fairy tales, Hero, methodology, structure, writing.